Alexander Smail was born on 14 May 1816 at Calashiels, Roxburghshire, Scotland, the son of Robert Smail and his wife Isobel, née Smart. He married Violet McCleod at Selkirk on 28 December 1838 and had 10 children, including George Edward Smail. Violet McLeod Smail died in Sydney on 27 June 1847. 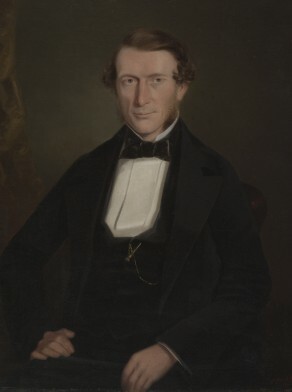 In 1847 at Sydney, he married Margaret Moore (1826-1870) and had at least three sons and two daughters. He died on 8 October 1867 and was buried in the family vault in the Old Presbyterian section of Rookwood Cemetery. The Smail family were in Sydney before 12 February 1844 when they buried their first born infant daughter Violet at the Sandhills Cemetery. By 1844 Alexander Smail had set up his bakery business in Bathurst Street. By 1851, Alexander Smail had moved the bakery to Argyle Street at Miller’s Point and remained in business there until his death in 1867. Alexander Smail was elected Alderman for Gipps Ward, 1 December 1864 to 4 September 1867, just before his death.